I have a pattern for the most ADORABLE teddy bear quilt. I *KNOW* I have the pattern. It's either in the back-issue of a magazine or a PDF. Searching the PDFs I have on the computer is fairly simple but checking out all the issues of magazines that I have? Ugh. 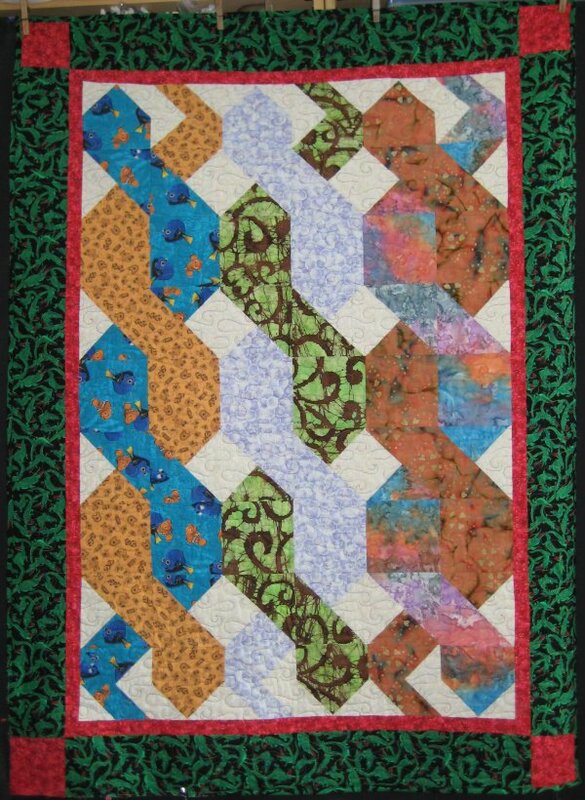 Once upon a time, I had saved a picture of a snake quilt, called "Slither". How much more "boy" can you get than snakes? 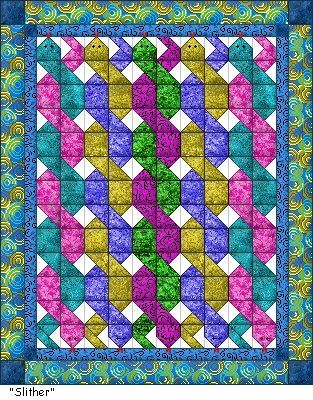 :-) This one is pairs of intertwined snakes [Mr. Pirate wondered why I was making a double helix quilt. :-) ]. I know I've seen this pattern *someplace*, either in a catalog or online. Think I can find it? Not a chance. My Google-Fu has failed me in my search to find it. 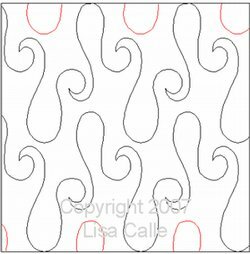 I do know it is NOT the Snake pattern designed by Cheri Strole from South Sea Imports, which is *similar* but not this pattern. Should someone recognize this pattern, I would deeply appreciate knowing, so I can properly credit the designer. With the colored layout from EQ in front of me to keep in on track, I started assembling the snakes. You really needed to keep track of which half-square triangle, which quarter square triangle went with which plain square. You couldn't just flip the block if you sewed the wrong color in the wrong spot! Once the center section (of the snakes) was all done, it was time to audition the border fabric. I was torn between very whimsical alligators and a subdued tone-on-tone. *I* liked the alligators, as it's in keeping with the boy-thing. But, I'm not so sure how the niece feels about SO. MANY. FABRICS! in a quilt, hence the subdued tone-on-tone. On the other hand, this niece had already mentioned to me (years ago) that she loves quilts. Ultimately, I chose the alligators simply because they were just so doggone cute. Then it came time for the quilting. I'm not quite sure why I decided to use a pantograph on this quilt but I did. I used "Raindrops" by Lisa Calle. It was, and remains even now, a *free* paper download. You print off as many as you need for the length of your quilt, tape them together and voila .. you have a pantograph. I thought that if I quilted the pantograph sideways, the little snake tongues would be more evident. Unfortunately, I loaded the quilt sideways (less quilt to advance if you're quilting across the width). 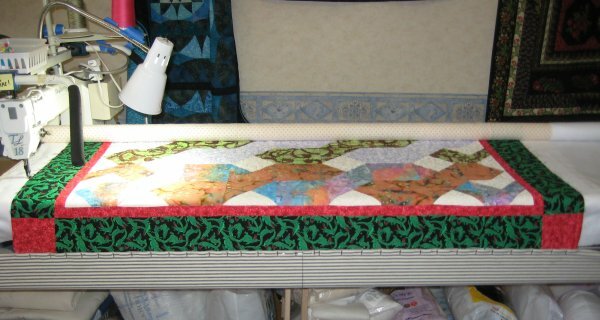 I didn't think to check the orientation of the pantograph in relation to the quilt. Duh. So, my potential little snake tongues came out as raindrops anyway! I get such a wonderful sense of satisfaction when a quilt is loaded straight and even. I just love seeing a horizontal seam *BE* horizontal and straight on the rails. It's nice when I go to the front of the machine to advance the quilt because then I can see all the nice stitching! But from the back of the machine? Ugh. I happened to be keeping track of the quilting time for this quilt. I try to do that these days but I'm not always 100% successful. However, my notes tell me that for this quilt, I took 1 hour and 15 minutes. Good Gosh! Talk about instant gratification! "Usually", I'm making bigger quilts and doing more intricate quilting so the time just seems to go on for days. weeks. years. who knows? (thank you, Eeyore!) So, the fact that this quilt took practically a blink of an eyelash to quilt was pleasantly surprising! 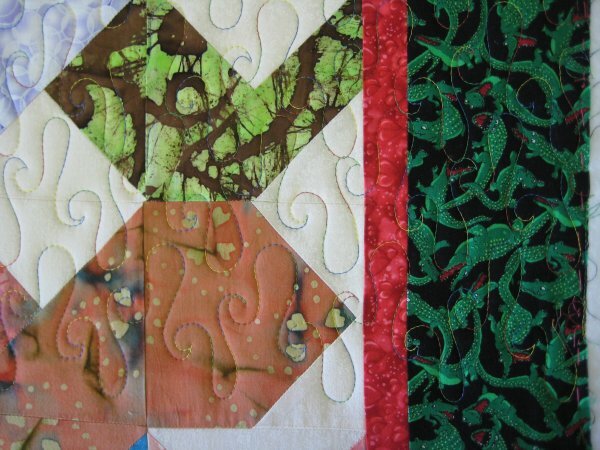 I always launder my quilts before gifting them. I like to make sure that 1) they are *clean* and 2) that all my stitching holds together in the washer/dryer. I would be horribly embarassed if the quilt came undone. and 3) it's going to shrink as much as it's going to. Additionally, I can tell the recipient that they can safely USE and launder the quilt ... tossing it in the washer/dryer is not going to ruin it in any way. I never quite know if the baby quilts really get used as I hope they could. When I gave the quilt to Mr. Pirate's niece, I did mention that it could be used as a play mat in the house or on the lawn, as well as, obviously, a quilt. I do hope she takes my suggestions to heart and really does use it. But, one never knows.